River has been training in Muay Thai Kickboxing since 2010 and has currently achieved his Black level under the Blitz Thai boxing curriculum. River took his passion for Muay Thai in a competitive direction from amateur to now pro-fighter profile. 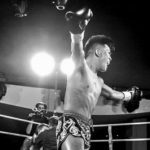 He holds the current Victorian IKBF title and MTA VIC State title under featherweight category with an impressive 14 Muay Thai Fights with 13 wins and one draw.